Since 1998, we have proudly been serving the local area in providing residential and commercial roof repairs and restorations. We are a full-service roofing company but specialize in roof restorations. A roof restoration is where your roof is beyond a simple repair, but getting a full replacement could be a waste of money as you could still get a minimum of a decade out of your roof. By applying protective coatings over your existing roof, homeowners only have to pay a fraction of the cost of what an expensive roof replacement would entail. We also use quality roofing products like Conklin that will help your roof coatings and restorations last as long as possible. We are certified and trained in the application of this roofing material. 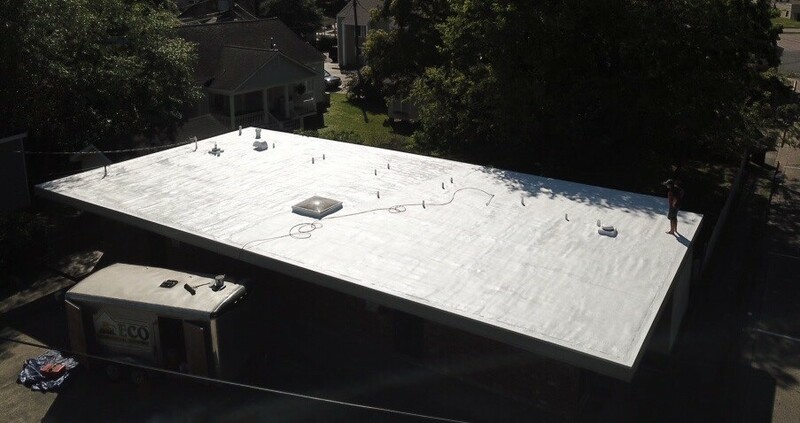 If you think your roof is done for, call a New Orleans, LA roofer at ECO Commercial at (833) 200-0571 to see if you could benefit from roof restoration. Silicone Roof Contractor Silicone is a great option for roof restoration, as it is found in many single-ply roofing materials that can last for a minimum of 20 years. Acrylic Roof Contractor If you want a flexible and waterproof coating for your roof, choose acrylic roof restoration. Polyurea Roof Contractor Polyurea is one of the only roof coatings that can be applied in any climate and weather because they dry so quickly, making them easy to install. Elastomeric Roof Contractor If you live in a rainy area or are worried about leaks, get elastomeric roof coatings for your roof restoration. 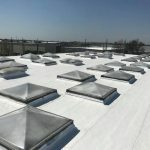 Commercial Roof Restoration Commercial roof restoration is a great alternative to commercial roof replacement, saving you thousands of dollars and extending the life of your roof. 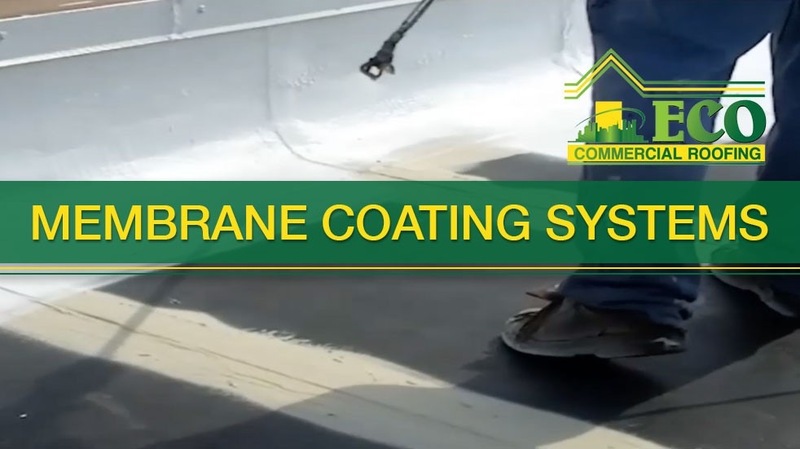 Flat Roof Coatings Designed especially for flat roofs, these coatings create a seamless layer so no water pools and creates leaks on the flat roof. Metal Roof Coatings Metal roof coatings help to prevent metal roofs from corroding and losing its shine. 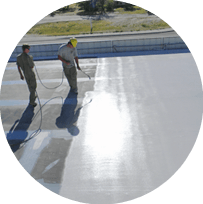 Rubber Roof Coatings Rubber roof coatings can be applied as a liquid or rolled on and welded to create a seamless and waterproof layer. 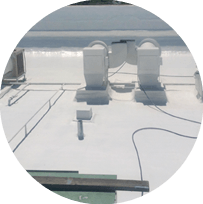 Industrial Roof Coatings Industrial roof coatings can handle extreme heat and chemicals, and go great with factories, warehouse, and commercial buildings with a lot of rooftop HVAC units. Here at ECO Commercial, besides just supplying repair and installation roofing services, we go above and beyond and offer other home repair services! Many roofing companies only strictly offer roofing installation or repair services, but our team goes the extra mile to provide complete customer satisfaction by providing more qualified services. 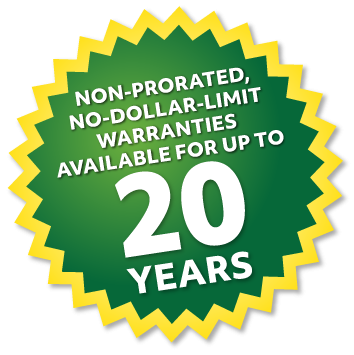 With 20 years in the roofing industry, we know everything about roofs and are happy to repair often-forgot about parts of your roofing system like the chimney or the flashing. 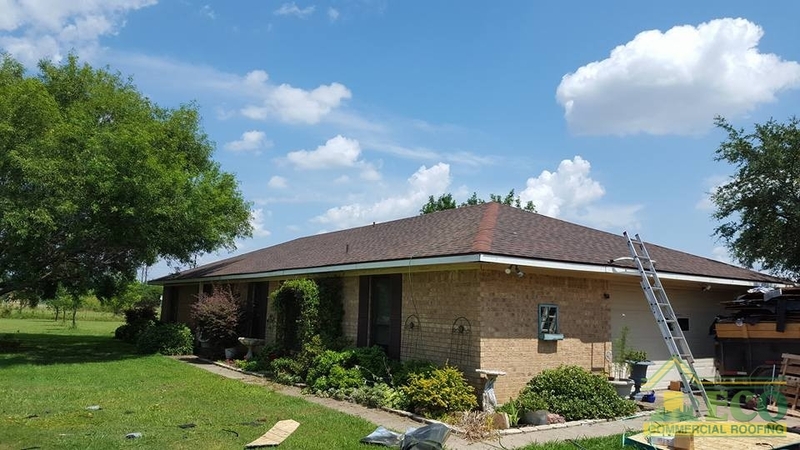 If you need your skylight replaced, or your soffit and fascia repaired on either a commercial or residential property, don’t hesitate to call for a roofer in New Orleans, LA at (833) 200-0571 today! Spray Foam Insulation If you need your attic insulated to cut down on temperature and noise, consider spray foam! It’s quicker and gets into all the crevices. Roof Gutter Install & Repair Gutters take a beating from storms, animals, and trees. 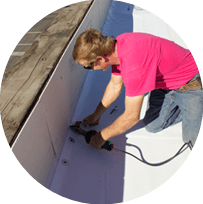 If you need gutter installation or repair, call us today. Window Replacement We also provide window replacement! Remove your drafty or broken window and get new ones with our help! Chimney Repair Chimneys can get clogged and become a fire hazard if not cleaned or repaired. Skylight Repair & Replacement We provide skylight repair and replacement services to both residential and commercial properties. 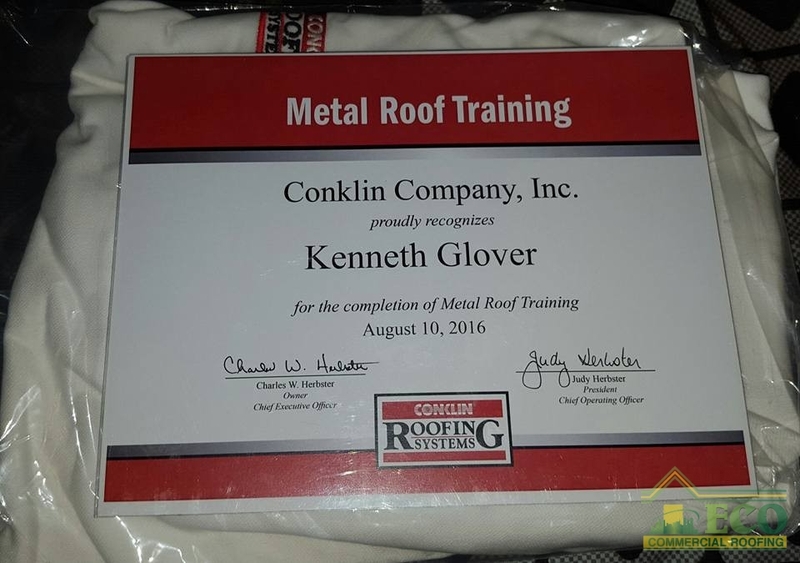 Our Roofer Company Are Conklin Roofing Trained and Certified! We can assist you with all of your roof services, from home roof repairs and installations to commercial roofing replacement. Our employees have years of roofing experience, making them skilled and professional roofers. We are certified to install Conklin metal roofing materials, so call us to install some of our inventory on your roof today! Scroll through the links in the tabs below to know more about the services we provide. The roofing service you need not mentioned Simply contact us at (833) 200-0571 and ask one of our roofers if we provide that service. 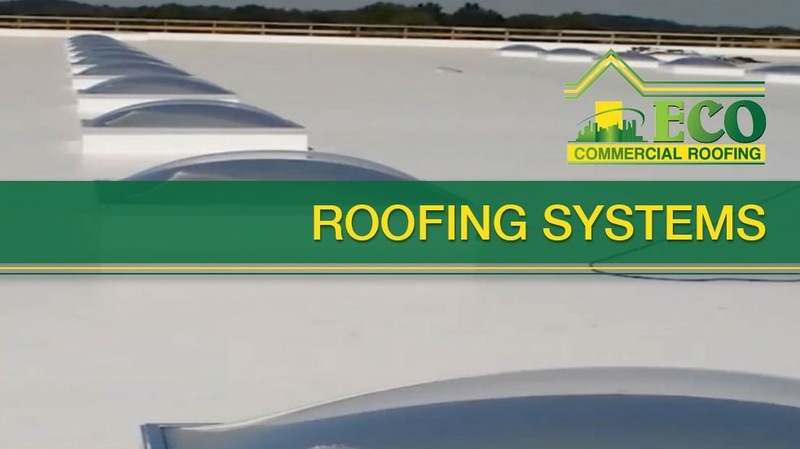 You can count on ECO Commercial for quality roofing services in New Orleans, LA. Keep your home in the best shape it can be by making sure your roof is well-maintained. Ignoring problems in your roof can lead to leaks, which can reach the inside of your home and cause mold and wood rot. Annual roof inspections can prevent these major disasters from happening. Also getting a roof made of higher quality helps, as water and hail have a harder time penetrating it. Premium roofs like impact resistant shingles and synthetic tile last longer than the popular asphalt roofing system and protection better protection. Other parts of your residential roof that need to be maintained are your roof flashing and your soffit and fascia, as water easily gets into gaps between all three of these areas. If you need a roofer in New Orleans, LA for any residential roofing services, call ECO Commercial at (833) 200-0571 today. Roof Repair Company Whether you have a hole that needs patching or shingles that need replacing, call us for residential roof repair. Roof Installation Getting a new residential roof and looking for a roofer? Call us for residential roof installation! Asphalt Shingle Roof Repair & Replacement Asphalt shingles are the most affordable roofing systems, but only last 20 years and need to be replaced quicker than others. Roof Inspections Yearly roof inspections help to identify issues in your roof and repair them quickly so that they don’t escalate into replacements. Roof Flashing Repair Roof flashing is the metal usually found around chimneys and the edges of roofs. Soffit & Fascia Roof Repair Soffit and fascia are found on the edges of roofs and under gutters and help to protect the roof from rainwater. Premium Roof Systems Premium roofs are more expensive because they are higher quality materials that last longer and provide better benefits and strength. Synthetic Shingles Synthetic shingles are a great option if you want tile or slate but are on a budget or if your roof can’t handle heavy weight. Roof Replacement Roof replacement should be a last resort, as it is very expensive. See if you can get roof restoration instead. 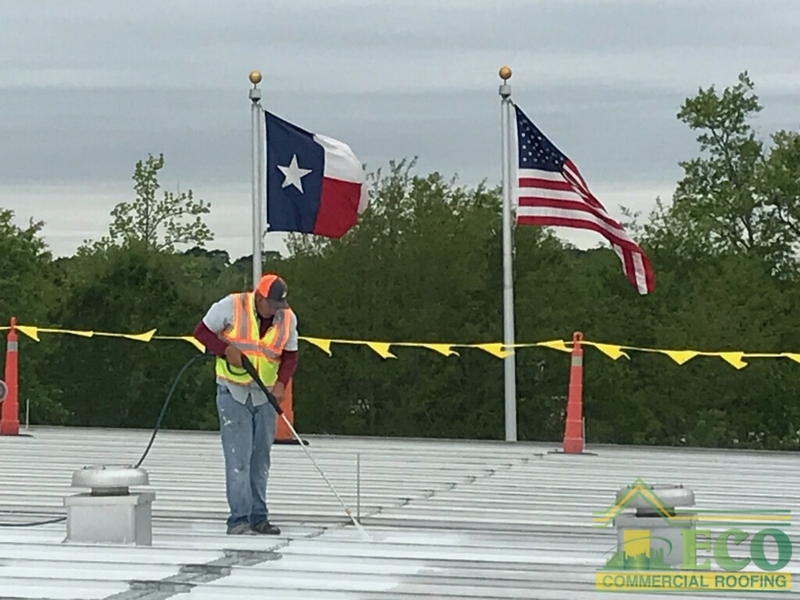 Commercial roofing needs to be tough, as it sees more damage from the sun and elements and is stretched over a wider expanse of space. Roofs for commercial buildings are usually flat, as it saves money, and there is no need for pointed roofs as commercial buildings don’t need attics like residences do and can keep extra storage on the flat roof. 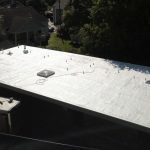 Flat roofs have many great benefits like affordability, toughness, walkability, storage space, and being reflective, but there are some downsides. Water pools on flat roofs and has no slopes to drain off of, just sitting there until it eventually leaks through to the ceiling. Also, since the entire roof is flat, the sun is always shining on it, causing UV damage and making the building hotter. These all can be reduced with repairs and by adding reflective and restorative roof coatings. 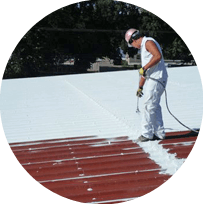 Call (833) 200-0571 for a ECO Commercial roofer in New Orleans, LA to repair or apply cool roofing to your commercial roof. 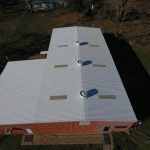 Single Ply Roof Install Company Single ply roofs are seamless one layer coatings that create a waterproof barrier and is reflective and eco-friendly. Modified Bitumen Roof Repair & Installation Modified bitumen roofs are tougher than single ply roofs but similar in design and function. Commercial Roof Repair Commercial roofs get damaged from sun and weather. 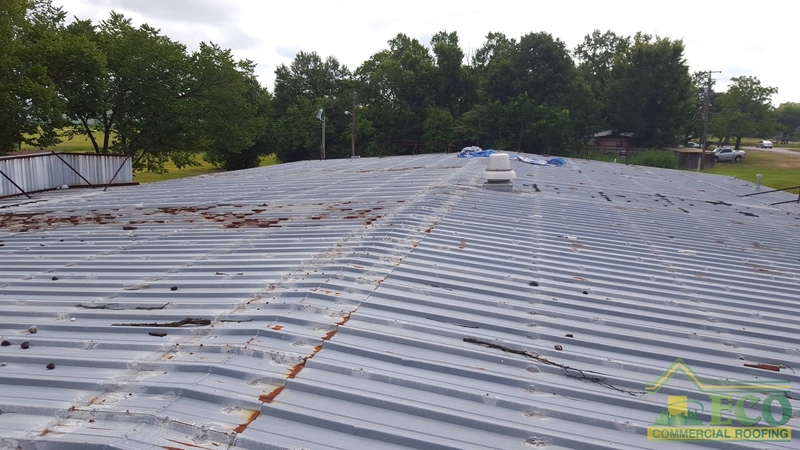 If your commercial roof needs repairs, call us today! Built Up Roofing Built up roofs are made of asphalt and tar stacked one on top of the other to create thick bases. Flat Roof Repair & Installation Flat roofs often get holes and leaks from water pooling with nowhere to drain. Cool (Reflective) Roofs Cool roofs help to reflect sunlight and lower building temperature, which lowers your energy bill. Green Roofing Green roofs can either be roofs with vegetation on them or eco-friendly cool roofs. 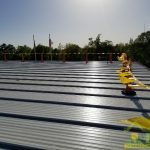 Commercial Roof Installation Call us today if you need commercial roof installation for your commercial property. Industrial Roofing Industrial roofs are tougher than commercial roofs and are good for high-security buildings like government and hospital buildings. Commercial Roof Replacement If your commercial roof is beyond repair and needs to be replaced, call us for fast replacement services. 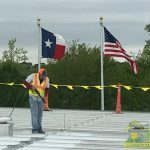 Commercial Foam Roofing Foam roofing is a cool roofing method that is also quiet, allowing you to continue business while installation happens. 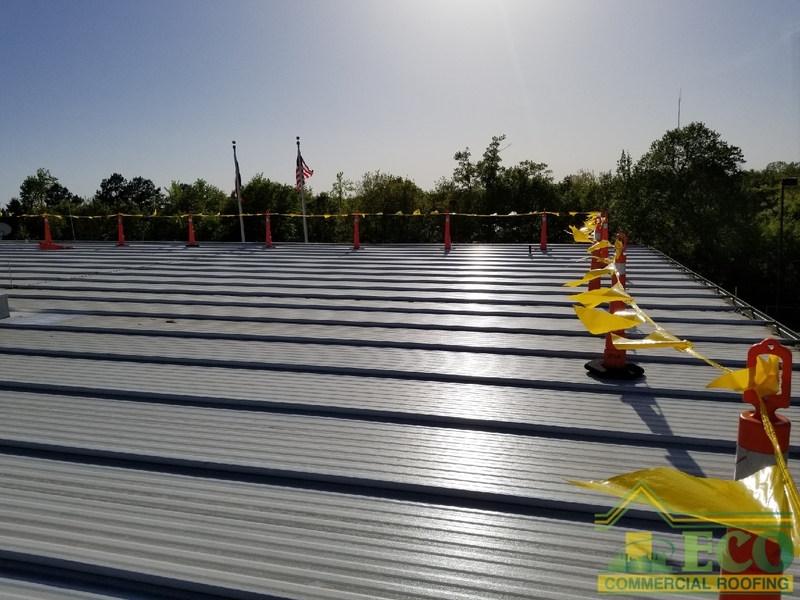 Commercial Metal Roofing Repair & Install Metal roofs are great for commercial buildings as they require virtually no maintenance in their 50-year lifespan. Commercial Roof Consultant If you need roofing services but want a second opinion, get a roofing consultant to help you make decisions! Get a Roofer Trained in Conklin Metal Roof Installation- Us! Metal goes great with both residential and commercial roofs. It is super durable and long-lasting, with a lifespan of 50 years! Metal is fireproof and can withstand all types of weather and storms. The metallic shine of the roof also reflects sunlight, helping to cool the property and lower temperatures and energy bills. You can get a metal roof coating applied on top of your metal roofing to prevent rusting and from the system losing its shine. 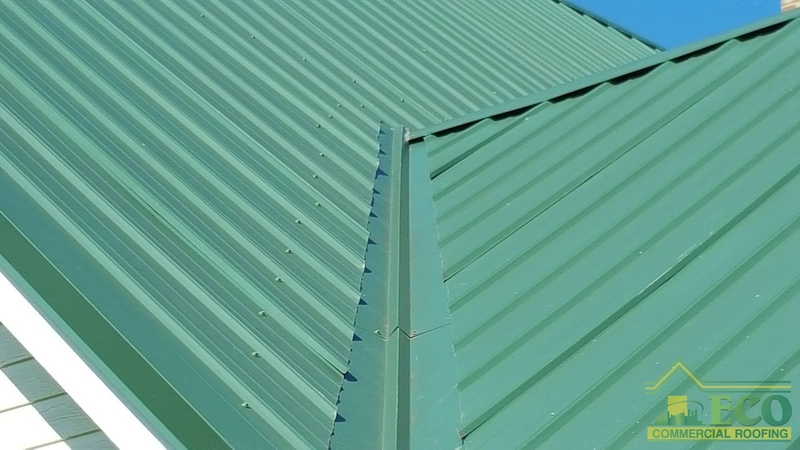 Metal roofs are also available in a number of painted colors if you don’t like the natural metallic look. 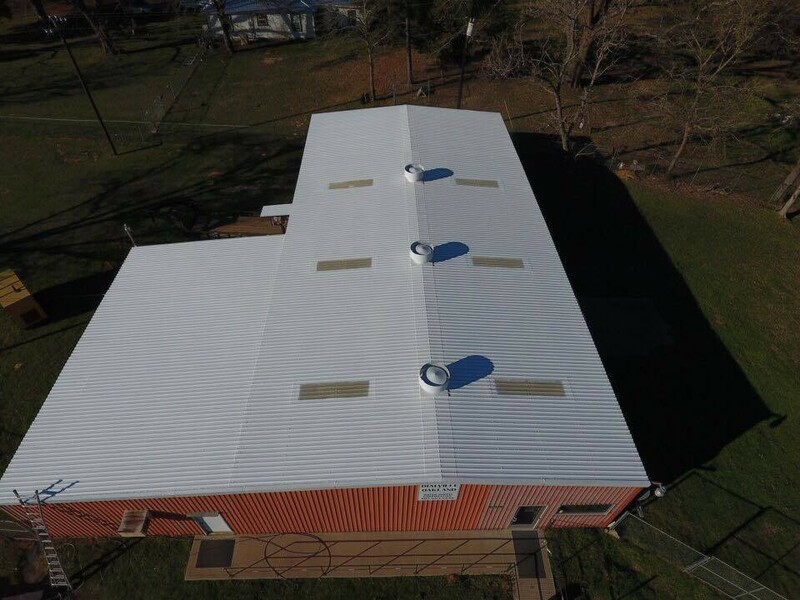 To learn more about the great benefits that having a metal roof for your residential or commercial property can bring you, contact a roofer in New Orleans, LA at (833) 200-0571 today. Standing Seam Metal Roof Installation Standing seam metal roofs are easy to install and come in two variations: mechanical or snap lock. Steel Roofing Steel roofing is extremely light and flexible, but also sturdy enough to withstand fire and all elements. Aluminum Roofing Aluminum roofing is the only metal roof that won’t corrode from salt in the air and is great for coastal areas. Stone Coated Steel Stone coated steel has a steel base but has a painted coating that makes it appear like stone if metal isn’t your cup of tea. Corrugated Metal Corrugated metal gives the more industrial look and is usually more seen on commercial buildings. Metal Shingle Metal shingles are lightweight and give the look of shingles but the durability of metal. Residential Metal Roofing Metal is becoming popular with homeowners because of its 50-year lifespan and great benefits like being resistant to all elements. Mechanical Lock Metal Roof Mechanical lock metal roofs are made for low slope roofs and easily snap into place for quick installation. Snap Lock Metal Roof Snap lock metal roofs are the opposite of mechanical lock and are made for sloped roofs and snap into place. If you need a roofing material that’s even tougher than commercial roofs, get industrial roofing! 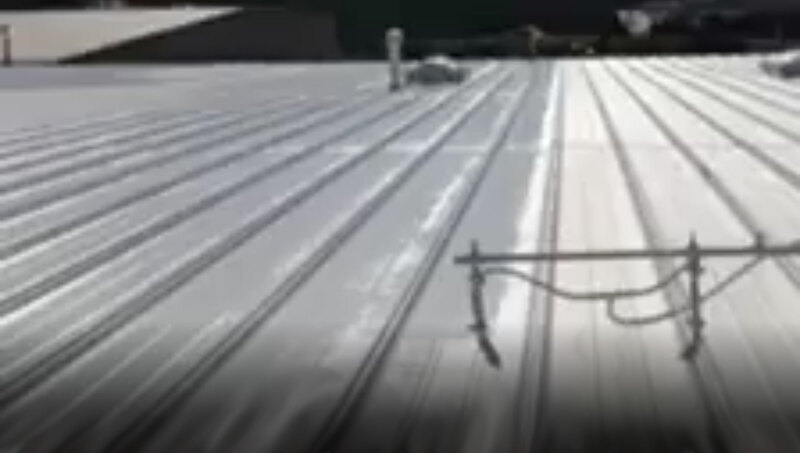 Industrial roofing can withstand high heat, chemicals, and temperature fluctuations. Industrial roofs are beneficial for buildings that have a lot of HVAC units and house a lot of people, like hospitals or apartment complexes. 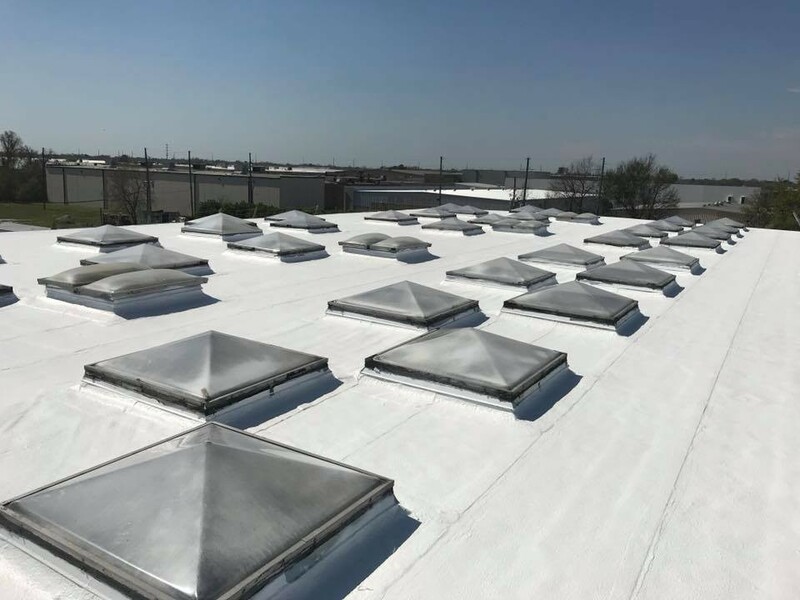 If you are interested in getting industrial roofing for your commercial building, contact a ECO Commercial roofer in New Orleans, LA at (833) 200-0571 today. Roofing for Apartments & Hotels Multi-family complexes like apartments and hotels need industrial roofing to withstand all the temperature changes and rooftop HVAC units. 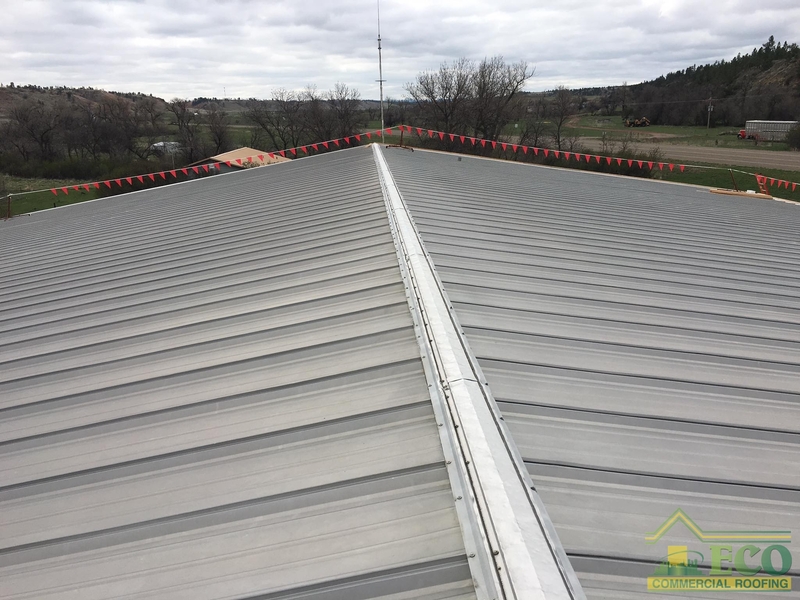 Roofing for Agricultural Buildings Industrial roofs go great with agricultural buildings since they are like warehouses that see a lot of activity every day. Hospitals & Healthcare Roof Repair Hospitals need strong roofs to protect all the sick, and industrial roofing fits that description. Roofing for Churches Churches hold a lot of people, and industrial roofs like metal ensure that they don’t have to worry about repairs for 50 years. Government Roofing Contractor Government buildings need industrial roofs to protect workers, citizens, and important documents from the elements. 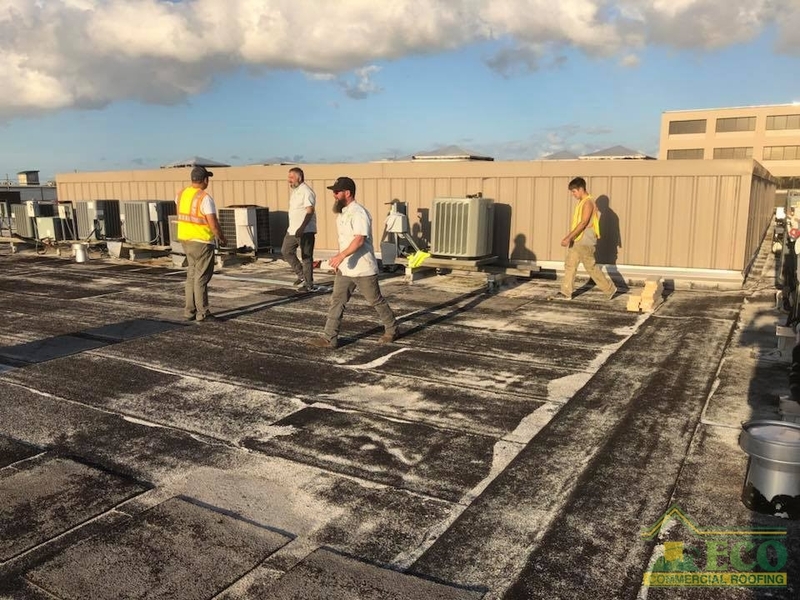 Business & Office Building Roof Repair Many offices have industrial roofs as there are a lot of HVAC units in the building, and the industrial roof helps to regulate the temperatures. If Your Roof Looks Like This After A Storm, Cal For A Roofer Today For Storm Damage Repairs! Living in this area, storms are a common occurrence and really severe ones can do serious damage on a roof. Hail can dent roofs and knock off shingles. Wind can blow roof materials off and knock trees onto your home. Rain can flood your roof and lead to leaks. Snow can pile up and cause your roof to collapse! We understand that mother nature has a mind of her own, which is why we also offer emergency roof repair for situations that are just out of our control and leave us blindsided. Our team will also help you with your insurance and assist you in filing storm damage roof insurance claims. For a storm damage repair roofer in New Orleans, LA, call ECO Commercial at (833) 200-0571 today. Emergency Roof Repair Sudden storm roll through and wreck havoc on your roof? Call us for emergency repairs today! Roof Leaks Repaired & Patched We can repair or patch up that leaky hole in your roof when you call our roofers for leak repair today! Hail Damage Roof Repair Hail can knock shingles off, dent metal roofs, and put holes in your roof, so repair is needed after a hailstorm. Wind Damage Roof Repair Wind can do damage similar to hail, like blowing shingles off, ripping up pieces of roofing, and knocking trees onto roofs. Roof Insurance Claims Help When you call us for storm damage roof repair, we will help you file insurance claims for roof storm damage. 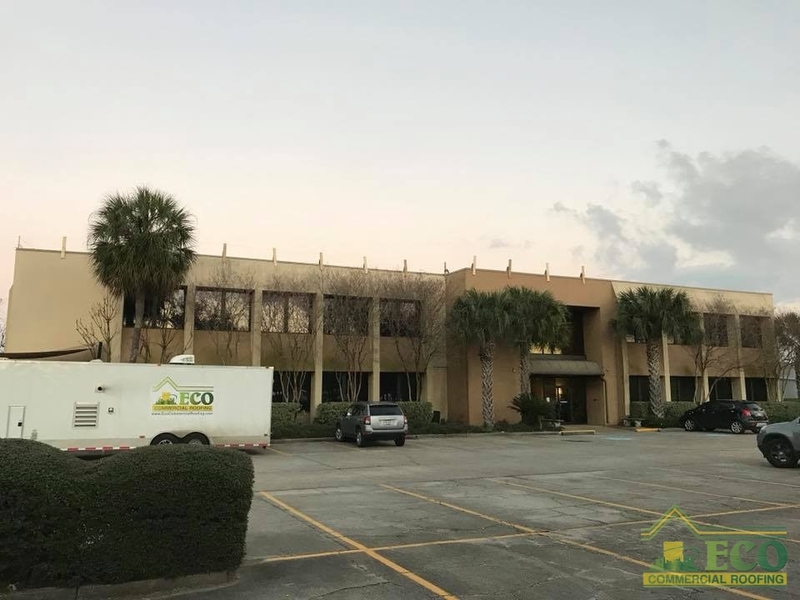 Updated on January 21, 2019 at 10:51 am by ECO Commercial.